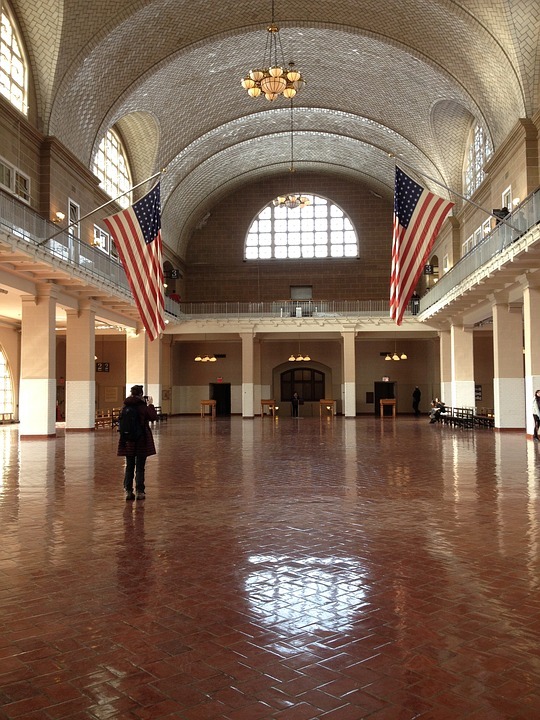 Ellis Island, in Upper New York Bay, was the gateway for over 12 million immigrants to the U.S. as the United States' busiest immigrant inspection station for over 60 years from 1892 until 1954. Ellis Island was opened January 1, 1892. The island was greatly expanded with land reclamation between 1892 and 1934. Before that, the much smaller original island was the site of Fort Gibson and later a naval magazine. The island was made part of the Statue of Liberty National Monument in 1965 and has hosted a museum of immigration since 1990 through 1995. It was long considered part of New York, but a 1998 United States Supreme Court decision found that most of the island is in New Jersey. The south side of the island, home to the Ellis Island Immigrant Hospital, is closed to the general public although there are tours of the hospital itself. This tourist attractions is nice. It can be reached only from New Jersey, or New York by boats. The island is the home to the liberty stadium. We do not know the real intention of the French king, Louis xxxx,but the idea of freedom is good, and had since been part of the foundation of the United States of America. Weather is good in June,at least it's true this year. Awesome place. A place in the must see list. Ellis island è un isolotto artificiale che si trova alla foce del fiume Hudson nella baia di New York ,antico arsenale militare, dal 1892 al 1954 ,anno della chiusura, è stato il principale punto di ingresso per gli immigrati che sbarcavano negli Stati Uniti, adesso è un museo l'Ellis Island Immigration Museum. È visitabile utilizzando il medesimo biglietto e traghetto che consente l'accesso anche alla vicina Statua della Libertà. Un museo carico di bagagli,foto,ricordi e di speranza che le persone portavano con se lasciando la propria terra, per cercare un futuro migliore. Amazing visit. I would recommend not going with little kids. I took mine 4 and 7 they were bored they didn’t appreciate it as much as I did. I really want to do the hard hat tour it looks amazing. This was a surprise just how good a museum this is. The audio tour is engaging and the exhibits don't whitewash away any past transgressions. The boat ticket that got us here also includes a trip to the Statue of Liberty, but make sure you come early because you'll not do both if you get here after 3pm. For American families, you can even freely look up the records from Ellis island immigrants to find out about your ancestors. Boat trips to this island can be made from either NY or NJ, and you can return to either after. I highly recommend giving at least 4 hours to this outing.